We haven't completed the first full week of March yet, and I'm already posting back-to-back days on the Yankees. Probably a signal of things to come in Spring 2013. 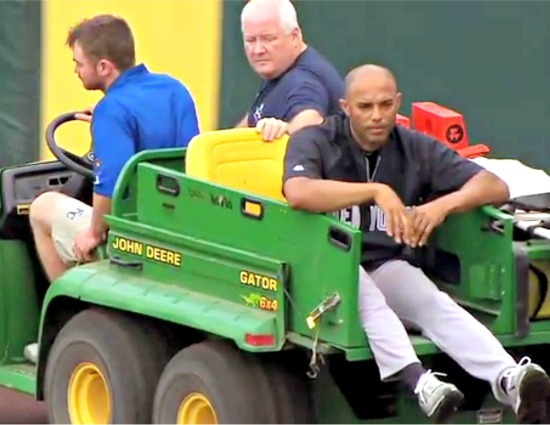 It looks like Mariano Rivera will call it a career at this season's conclusion. It isn't that big a surprise, #42 is now 43 years of age. He may have done it after last season, but last season was never completed after a freak injury during pregame warm-ups in Kansas City in May 2012. Rivera wasn't going out like that. The sport's greatest specialist needed to lace 'em up for one more year, and the Yankees will need every bit of him. But also, whether this arrangement was initiated by the Rivera or the team, it solves an unprecedented riddle going forward. What do you do with the games best closer when he can no longer close? A superstar everyday player can be eased out in a DH role, platoon, or as a pinch-hitter. A former ace starting pitcher can still soldier on from the bullpen or be a ticket draw for a lesser team. But a closer? There's nowhere to go from being the guy protecting a 1-2 run lead for 3+ outs, 45 times a season. Exit Light, Enter Night...Off To Never-Neverland. Mariano Rivera will have the 2013 season as a victory lap around the American League. Hopefully he'll have a season worthy of his incredible career, and look back from Never-Neverland with no regrets. And the Yankees will have a year to plan for the succession, without worrying about muddying the reputation of a descending icon. We hope. And as been brought up many times, Rivera will be the last MLB player ever to wear #42, the year that the motion picture 42 is released. Maybe his final season will be cinematic as well.